I like simple truth. Once while I was visiting a church in Dallas, an older, white-haired gentleman gave a fascinating message. He pulled out a couple of transparencies (do you remember transparencies?) and made his presentation. He made two very simple points. The funny thing is that I don’t remember the details of his talk, but I never forgot his points. In fact, they made such an impact on me that I took those two points, added a lot of verses and stories to them, and began spreading this simple but profound message to audiences when I speak. These two talks have now turned into this DVD! 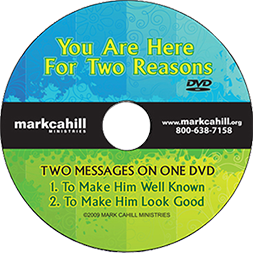 It includes two full-length messages on one DVD! Prepare to be as impacted as I was when I first heard this message. You will be challenged and encouraged about why God has left you here on earth after you became born again and saved!! To Make God Well Known – Every person needs the life saving truths of the death, burial, and resurrection of Jesus Christ. They can’t be saved unless we stand up as strong witnesses for Him. God gives us the opportunities to declare His Name to the world but it’s up to us to walk into those moments and speak up boldly. To Make God Look Good – Every Christian is an ambassador of Christ. We need to walk worthy of the gospel so that we represent God’s character of love and truth to the world. One of the ways we open the hearts of people to listen to the gospel is by freely blessing them. The Bible says it is more blessed to give than receive, which becomes abundantly evident when we put this truth into practice.